Amy Schuber: Welcome to “Inspired Conversations.” This is Amy Schuber. I am excited to be with Neha Sangwan, MD, CEO and founder of Intuitive Intelligence. She’s an internal medicine physician, international speaker, and corporate communication expert. Her private practice in corporate consulting focuses on empowering individuals, organizational leaders, and their teams with the tools for clear, effective communication. She addresses the root cause of stress, miscommunication, and interpersonal conflict, often healing chronic conditions, such as headaches, insomnia, anxiety, and depression. She regularly consults with organizations such as the American Heart Association, American Express, Kaiser Permanente, and Google and has shared her keynote presentation on the stages of TEDx. 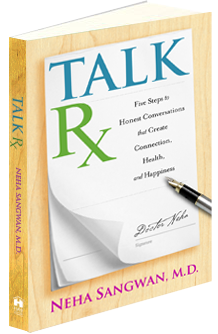 She’s also the author of TalkRx: Five Steps to Honest Conversations That Create Connection, Health, and Happiness. I’m so thrilled to be here with you. Welcome, Doctor Neha. Doctor Neha: Thank you. I’m honored to be with you. Amy Schuber: It’s so great to be in a conversation. I love to have a conversation with somebody who has discovered something and made their own changes in their life, so I’m excited to see where this goes because communication is about everything that’s happening in our world right now. I want to ask you first, what inspired you to change the direction of your career? We might need a little bit of backstory from you, but I’m just curious about what brought you to the moment of writing a book about communication and sharing in a different way than what you probably thought you’d be doing when you went off to med school? Doctor Neha: I believe it starts all the way back from when you’re young. Why am I here teaching communication? Because my mother would say that of the three daughters she raised, I was the most uncommunicative and shut down—the one who was hardest to communicate with. Doctor Neha: I’ll tie this back into how people find their greatest passion. Yes, I felt pretty shut down. I didn’t know how to express emotions. Most people watch how the adults and older siblings in their families handle life when they don’t get what they want or when they do, or whether they say, “I love you.” Then they notice how to get love in that environment. There we are watching our role models and learning to mimic them without even knowing it. My parents are immigrants. They had an arranged marriage. They came over from India in 1965. They had us girls here, and so we had the divide of having parents from another culture but trying to fit in and belong here. I had an older sister. I was the younger one. So many things were confusing for me about how one actually expresses oneself and what’s okay and what’s not, and so I found that safety relied on me shutting down, going to my room, and crying myself to sleep. Amy Schuber: Wouldn’t that be brilliant? It seems so obvious and clear, but it’s the thing that’s missing because we project on each other and don’t take responsibility for our feelings. How did you see that manifest in people? It’s so interesting because you talk about how you started seeing the patterns related to communication in people’s sickness and their behavior, right? Doctor Neha: Absolutely. That was a little bit later in my life, for sure, when I started to tie it all into medicine and how I could help others, which brings me back to the idea I just mentioned about people’s passions and how if any of you are wondering, “How do I know what my passion is?” it’s composed of three parts. The first part is, what’s my own pain or wound from when I was younger that will feel more healed if I learn this [particular skill, job, service], do this or share this? The second piece is, how, by learning something new, can I then serve and help other people? The last piece is, how can I align with making a difference in the world? In other words, what’s something I can learn that can help me and heal me, then I can share with other people to make a difference in the world? It’s me, we, world. If I can do that, that’s my passion. It never gets old. Amy Schuber: Wow! Say that again. “Me, we, world,” so one, two, three. That’s what you meant by that? I was protecting myself. I just thought safety was shutting down. Once I learned how to communicate—What are my emotions? How do I express myself? How do I be authentic in a world as myself? Then there came the “we” part of the equation. In our DNA, all of us have the need for connection and belonging. We function in a “we” world, whether it’s with our families, whether it’s with our work or with our children. We have to also understand how there can be “me.” If I don’t balance me with the needs of we, I become narcissistic. I become self-absorbed. I become only focused on myself. Too much of that is not okay, so you balance that with we. Then there’s world, meaning “How am I connected to something greater than myself? How am I making a difference in the world?” When you can find something, like I found communication, that will help heal you, then every time you do it, it feels so purposeful. And I get better and better at it, so it gives me purpose and meaning. It helps other people solve their dilemma. They feel so grateful. I help them come off medications when they start to realize that their headache wasn’t an Advil deficiency. It was actually them not knowing how to handle the anger of their partner, or it was them being in a toxic work environment way too long, or it was them being in a relationship that’s long since expired, but they didn’t have the courage to get out of it. Once they wake up, they feel so grateful because I can start helping them get off these meds that are numbing them, whether it’s insomnia medication or headache medication. Then the other piece is my ultimate dream—world peace. I believe that every human I help in conflict and communication so they can show up authentically helps us get closer to that. The me is healing me, the we is helping and serving others and making their lives better, and the world is making a difference that creates the world we want to live in. Amy Schuber: That is so interesting and so important, and it’s so perfectly timely for me right now. You’re resonating with me. It’s really about the self-discovery and self-exploration that we all need to do on another level at this moment. It’s like that responsibility for our lives and taking a deeper look. Like you said, and you mention in your book, our body is telling us something. It might be a headache or insomnia. Then you might treat it, but we don’t look deeper. We don’t go to that root cause. Then six months, a year later, that same symptom comes back, or it comes back in a different way, stronger, and we’re not listening to ourselves. Part of the communication, I also hear you saying, is with ourselves—learning to connect with ourselves and what’s really going on, so then we can express it. Doctor Neha: Exactly. If you think about communication, people say things like, “Oh, communication. That’s easy. I know how to communicate. I do it every day.” Well, I think they’d be really surprised to know that there are so many different types of communication. Just within the body, if you were to look at one cell, it has so many little organelles that have to function to make that one cell live and grow and get rid of waste and be nourished—in just that one cell. Then there are a bunch of cells that make up an organ, say your kidney or your heart. Then there’s the communication that happens between the systems, like your hormonal system, your endocrine system, or any system in your body. When that kind of communication breaks down on a physical level, we get a disease. That’s not even taking into account our emotional selves and our mental selves and our spiritual selves and our social selves. There are so many aspects to us. Sometimes people think that all communication means is something simple like, “Did I make sure I told someone I would meet them at five o’clock today? Well, I said that I would. See, I’m a good communicator.” That’s outside of us. Maybe you are a good communicator, and maybe you are really good with other people. What you’re talking about now is—Have we really sat down and thought about, “How do I communicate with me?” My body, my thoughts, my emotions. How have I been communicating? I believe we have never learned how. We’ve never had role models in that arena. If we have had role models, we remember them, and we say things like this: “Mr. Sondel was my favorite teacher ever.” We don’t actually break it down, but we know that somebody showed up as a leader in a way that moved us. But we don’t actually know what they did or how they did it so that we could translate that behavior. Amy Schuber: As if we would say, “This teacher has made me feel really good in the moment that I was most scared to take the stage, and I felt comforted by the words because they were so kind.” We don’t break it down to recognize and articulate our feelings about the situation. Doctor Neha: It’s fascinating. Sometimes people have said to me, “Why did you leave being a doctor in a white coat in a hospital to teach communication? Communication is so easy.” Whenever they say that to me, I just chuckle because people don’t actually understand. They’re not aware of how complex communication is and how emotions are driving nearly everything that’s happening. Most people don’t actually know how to navigate their emotions. Amy Schuber: It’s so true. Doctor Neha: Emotions are running the show. Somebody might say, “Oh, emotions aren’t important.” Any parent will tell you they are—as they can’t get their kids to bed at night or there are meltdowns of toddlers in stores when they can’t have the toy they want or mealtime. Emotions drive everything. They drive the purchase of our home. They drive the decisions we make to be with our partners. They drive so many decisions that we wish were data driven. Emotions are running the show. Emotions win elections, by the way. Amy Schuber: Yes. Isn’t that true? Doctor Neha: It doesn’t matter what type of emotion, right? Doctor Neha: You can use anything from hope to fear. You can use hatred. You can use love. When you can tap into people’s emotions, you can inspire and engage them to take action. That’s really important. Amy Schuber: It is, and that’s how we all are responding. We’re either reacting, or we’re responding in a thoughtful way. It’s so driven by our emotions. Being aware of the emotions is so important. It’s so funny because I say to a lot of clients, “Feel your feelings.” Sometimes people don’t know what that means. Do the exploration to let yourself have feelings and let them surface. I feel like we’re also in a society that conveys, “Don’t cry. You’re not upset. Get up. You’re okay. You’re fine,” where we brush [emotions] off, so we don’t actually process them. With all the drugs everybody is on, we are numb to a lot of things, whether we create it ourselves, or we take something to numb an emotion because it’s manifesting as a pain. We do a lot to numb ourselves. What would you say to people who are hearing this now and thinking, Yeah, I want to connect with myself or communicate with others? Where do I start? Where would I go with this? I would to find that root cause, like you’re talking about. Doctor Neha: I spent three years writing a book that will profoundly help them. It’s called TalkRx. Talk Prescription. It’s the Five Steps to Honest Conversations That Create Connection, Health, and Happiness. That’s number one. Now, practically, in this moment, what I would say to them is when they can’t feel their feelings or they say, “I don’t know what you’re talking about. I don’t feel anything,” I would start with the physical and give them something to hold, like a small cushion, something that’s a little malleable in their hands. “I want you to tell me that you can feel that cushion in your hand. What does it feel like?” I start in a physical way. Can you feel your feet on the ground? Can you feel your bottom on the chair? Can you scrunch up your shoulders and then let them go and let gravity pull them down? Before you can get someone to connect to their emotions, they have to first inhabit their body. We’re running around so fast. Everything is about faster, quicker, more, more with less, more with less, right? Doctor Neha: I really believe that a weakness is just a strength overused. Amy Schuber: Tell me more about that. Doctor Neha: [For example] Do I think it’s important that we use the left side of our brain to work on making things really efficient? I do. However, when that is the only focus—faster is better and more is better—and we keep going faster and faster and faster, we burn out because that strength got overused and became a weakness. We lose effectiveness in the name of efficiency. That’s not helpful. The brilliance about this is that you can use this principle for just about anything. Let’s talk about something like power. Everybody wants more power in their lives, to feel powerful. If somebody has power, and they don’t have enough of it, let’s say they have too little of it, they feel trapped or powerless, right? Doctor Neha: Let’s say someone has power, but then they start to use their power in a way to oppress other people and not care about anyone else. Now they’ve taken a strength, which is their own power, and they’ve started to overuse it. It will now become a weakness. True power actually comes from balance. Let’s talk about truth-telling, honesty. Honesty, is it important? Yes, it’s so important to be able to say the truth to yourself and to others. Now, if what you do is you become so blunt that you don’t care about the situation you’re in, who’s around you, and you just want to say anything at any time, and you blurt it out with no compassion, that truth that was such a gift in communication and could have been a strength becomes a weakness. They become like a bull in a china shop. Amy Schuber: It’s the balance of knowing how much, when, and with compassion. It’s bringing in your awareness to know what to do when with what you’ve got in the moment. Amy Schuber: I love that. I’ve never heard it put that way before. Doctor Neha: Well, I’m glad. It’s really helped me be able to stay present in honest conversations. I used to feel quite defensive and shut down, but now if someone says, “You didn’t even speak at the meeting. I really need to give you feedback that you didn’t say a word.” Okay, so they’re telling me that this is a weakness. Doctor Neha: What do I do? I say to myself, “Wow, okay, so one of my strengths is that I listen deeply, and I think deeply before I speak.” That’s the strength. The weakness happens when the meeting comes and goes, and my opinion was not in the room. Doctor Neha: When I can see things that way, it helps me. It helps me be open to find that sweet spot that feels right, that contributes, that listens deeply. Instead, what people do a lot of times in communication is what I did when I was young. They get feedback from somebody else and they just shut down, “Well, I’m never doing that again,” instead of realizing there’s actually a gem underneath it all if they could look for a strength that’s been overused. I was like, “Whoa!” It made me realize, “Wow, my opinion does matter.” It’s important to speak up in that moment. You’re reminding me of that time because sometimes I listen too deeply, and I might not respond because that’s an old habit to let everyone else have opinions. Amy Schuber: When we take that and witness how we’re playing with others, [we can see] how we can change it. What you just said about turning that weakness around and seeing your strength is a powerful move for us to use. Amy Schuber: It’s so brilliant. It’s interesting that you said we’re going faster and faster and we want to do more with less. I’m feeling that, and I’m feeling myself burn out on all that. I have my own way of working too hard or overworking on certain things. I don’t need to be so in it with everybody else because life is moving so fast. It can be hard to go at your own pace and find your essence again because we are in such a reactive, fast-moving world. It seems out-of-body because that doesn’t feel good to me in the moment. I’m wondering if you notice that with people. That slowing down motion could serve us. Doctor Neha: It’s interesting that you bring that up. In 2015, I launched my book and my PBS show, and then a health insurance company had contacted me to become their chief mindfulness officer. I went through a series of interviews over five months. In the end, it was kind of a decision on their part, but I knew too that it wasn’t the right fit because I wanted to bring communication into mindfulness. Doctor Neha: I had said to them, “I really appreciate that meditation and yoga slow people down through movement and through stillness. I believe those are very important because they give us insight. They slow us down enough that what’s unconscious can pop up to our conscious. That’s the value of slowing down and allowing yourself space. Are you interested in taking that awareness, that insight that people have, that wisdom that comes through meditation and yoga, and translating that into changed outcomes through communication?” That seemed like too big of a leap [to the company]. I thought to myself, One of the most forward-thinking health insurance companies in this nation thinks that communication is like … they haven’t quite gotten the link between communication and health. Doctor Neha: I was sad. I realized that maybe where I am as a physician or the ideas that I’m presenting are ones the world isn’t ready for quite yet. I decided that if I was going to start representing meditation and yoga in communication, I’d better get some slower gears on this mountain bike of Neha, you know? So last year, I traveled. I danced. I drew. I took workshops on drawing and meditating. I walked on the beach. It was uncomfortable at first because adrenaline and the rush of working in the hospital and writing a book and touring and speaking was the speed that I normally moved at. Each day, I would sit down for 10 or 15 minutes, and I would call that my meditation, but I don’t know that I’d actually, until last year, knew what it feels like to live slower. It changed me. It changed me because there’s a peace and a serenity that comes with it, in knowing that I’ll never forget how to do, do, do, do. It’s ingrained. I can get back into that pretty quickly. The slowing down, actually, there’s a brought a discomfort for me before I became comfortable with it. It’s important for people to slow down. What happens is awareness and insights start to come up for you and around you. You don’t keep running the same patterns over and over, wondering why nothing is changing. Sometimes it gets uncomfortable in your body, and if you don’t know how to breathe deeply, and you don’t have practices like meditation, movement, yoga, running, massage, taking hot baths that can help you move through that discomfort, it will be easier to just go back to doing. Amy Schuber: We approach that doing in a new way when we have peace and ease in our body because we’ve slowed down. Doctor Neha: The other thing that is important is I learned to enjoy my own good company. Until [this last year], I’ve always needed people around me. I’ve always needed the external stimulation. There was always a project, a deadline, a talk, and the next goal. There are those things, and I can breathe, and I can do nothing and thoroughly enjoy being present right now. Amy Schuber: That’s quite different from the way we’re moving and being. I speak for all of us. It’s a different approach. One of my friends recently said to me, “Do things differently, meaning don’t do anything.” It’s sort of a shocking thing to hear because I’m like, “I don’t know how to do that.” I’m so glad you shared that because it resonates with me, and it’s where I’m at as I’m shifting gears to being present and slowing down. It doesn’t mean you’re unproductive! Doctor Neha: If you don’t slow down, you actually don’t know what your body needs because you don’t inhabit your body. You inhabit the left half of your head. It’s a short 18-inch distance, but to drop from your head to your heart is one step. Then you have to drop from there into inhabiting your body, where you actually feel your body and know what it needs when it’s thirsty, when it’s hungry, rather than eating to numb or drinking alcohol so you don’t feel the stress, or popping pills so that you can knock yourself out and sleep, even though your mind is overactive because you’re anxious. I had one more thought about what you were saying; let’s tie it back to the weakness, a weakness is just a strength overused. Productivity is important. Checking things off our to-do list is important. When it’s all about efficiency, efficiency, efficiency, you are not as effective anymore. There’s a big difference because doing things faster and quicker may require you to go back and have to redo things because you missed details or you didn’t do it right—all of a sudden your efficiency has taken away the effectiveness. Amy Schuber: That’s a really good point and a good question. Thank you so much. Neha, I could talk to you about so many different things. I feel like we could have another follow-up interview and go in a totally different direction. I’m grateful you shared your wisdom with me today. I’m going to take us into the inspired round of questions. Amy Schuber: The first one is, what’s your go-to book for inspiration? Doctor Neha: I think of different parts of me. The physician in me right now just recently read Atul Gawande’s Being Mortal. It’s all about medicine and what matters in the end. We have all these tools and machines and things that can artificially keep people alive forever. Paying attention to what actually matters in the end and what makes life meaningful for people is what he describes so eloquently. For anyone out there who’s facing their parents getting older, their grandparents getting older, themselves getting older and facing mortality, that book is one of my biggest go-to’s as I watch my parents get older. As a citizen and a human being, the book that really moved me was Brene Brown’s book The Gifts of Imperfection. I’ve read several of her books, but that one on shame and the difference between shame helped me understand where I was blocked. Then just for fun, I’d say it depends on what mood I’m in, but I would say Tiny Beautiful Things by Cheryl Strayed, which reminds me not to take myself too seriously. Amy Schuber: Awesome. Thank you for those three perspectives. I love that. Then I’m wondering if you have a song that lifts you up when you hear it, any song that you go to. Doctor Neha: For a fun one, it would be like “Jai Ho” or something that has a strong beat. For the spiritual part of it, I would say “Imagine” by John Lennon and all the versions of that have been done of it. It brings me back to that goal and dream of imagining a world where we’re all connected. Doctor Neha: It depends. Am I trying to get my body moving and dancing around my kitchen, or is it like a more reflective and soulful reconnection that I need? Amy Schuber: There’s something for either in all of those moments, right? Is there a resource that you use that you’d love to share with people? It can be anything, something that makes your life easier, something you just love to use. I would say the super power in the world that I tap into is human connection. It’s something we’re losing fast. To me, it is the most interesting, the most unique, and the most resourceful because it’s not just a person, but it’s the sum of all of their unique experiences. It’s not literally a resource, but every person I meet and I see, to me, is a wealth of resource. I always am curious: “What am I here to learn from you?” That’s how I see people, even people I don’t know. Amy Schuber: That’s a great, great reminder. Thank you so much for sharing that with me today. Then the next question is, what’s something that would surprise everyone about you? Doctor Neha: Well, I guess if they’ve listened to this, they probably don’t think I’m your typical doctor. I spent the first half of my life learning about data and information and reading research papers that say things like, “N=10,000,” meaning 10,000 subjects in a research study, double-blinded placebo-controlled trials. As much as I think that’s important, I believe that everyone listening has their own intuition and our intuition is as important as data is. I give it equal weight. When I’m telling a patient what I think is a good option for what they are dealing with, and they tell me, “That doesn’t feel right to me. I don’t think that’s okay,” to me, that is equal weight to research studies and medical opinions. If it doesn’t feel right to this human, then it’s not right. My job is to honor their path. My job is not to make them wrong. I rely on my intuition as much as I rely on data, and sometimes my intuition wins over data. People might be surprised to know that I take leaps of faith without knowing exactly what’s next. As I’m getting older, I’m starting to realize that once I tap into my body, my heart, my mind, and pay attention to signs in the world, my intuition is actually the strongest. Amy Schuber: That’s such a great reminder. Thank you so much. That’s so insightful. Then the last question is, what’s the most important thing you want people to know about you? Amy Schuber: Thank you for sharing that. It’s such a pleasure to get to know you and have this conversation with you. I want you to share where people can find your book, how to get more information, and where they can meet and hear you. Doctor Neha: My book is on Amazon, Barnes & Noble. It’s published by Hay House, so they can get it online. There’s also a Kindle version. Also, if somebody’s not sure if they want to get the book, they can go to my website, doctorneha.com. If you register your name and email, you will get the first 25 pages of the book for free, so you can check it out. Also, I do book clubs with the author. I give workshops. I speak at conferences. Every Thursday, I send out a free video podcast and blog, where people can see a sneak peek of how I work privately with people on communication to learn really practical tools. On Twitter, I’m @drnehasangwan. On Facebook, it’s Neha Sangwan, M.D. Amy Schuber: Thank you so much for being with me today and sharing so much wisdom. I’ll have the show notes and all the information that Dr. Neha gave with us today at inspiredconversations.net/drneha. Thank you, everyone, for listening. Remember to be inspired by you. I’ll catch you next time.